I thought it would have been easier. Through determination or good fortune I had always done what I wanted or got what I needed. Yet, as a wedding guest in my late 20s, I’d been tacked on to my parents’ invitation. I wondered when I would be the bride, proudly and lovingly taking the hand of a teary groom during his speech, then throwing the bouquet to the single girls like salt into their wounds. Would I browse racks of baby outfits and wraps to buy something for a baby that was mine, rather than just another gift? Falling in love with the tiniest pair of leather shoes, I bought them, just in case. I put them high up in a cupboard and then finished packing my vehicle. My best friend and I agreed if we didn’t find husbands on our trip around Australia, we’d go around again. Could that be the start of my autobiography? It was my submission to an ABC Radio Nightlife ‘Get Reading’ competition that asked for the first 150 words of your life story. And I was disappointed when I didn’t win (shoosh, I did my best – they weren’t asking for an extraordinary life. And in fact, isn’t good writing the telling of ordinary events in an extraordinary way?). So obviously I’d had expectations about winning, and that’s why I was disappointed. But if I turn it around, I loved the whole process so much. I loved wondering, ‘Well, what would the first 150 words of my life story be anyway?’. I enjoyed the process of cutting and polishing a page of thoughts into 150 words (it’s not many – try it!). And since my dubious ‘if you don’t have expectations, you won’t be disappointed’ motto has failed me recently, I’m taking on a new one. It’s about being ‘committed but not attached’. Committed to achieving results but not attached to the outcome. That works a lot better. If I’d been committed to having a fun day at the Echuca market and promoting our products, but not attached to the amount of sales we made, I’d have driven home very happy. If I’d been committed to submitting an entry into the ABC competition but not attached to winning, I’d have simply enjoyed the process and that would be the end of it. No disappointment. Now I need to commit myself to cleaning up toys from the lounge room floor. And piles of fabric and a tape measure from the kitchen table. And Elsie’s pyjamas and some toys from the coffee table. And as for the kitchen bench, I’ll find homes for a piece of black Lego, the camera, last week’s newspapers, some unopened bills, a funnel, half a Cruskit, a cook book and three AA batteries that may or may not be flat. But I’m not going to be attached to getting all these surfaces tidy in this session alone. 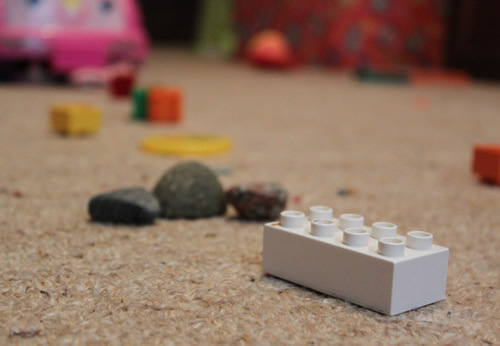 If Elsie and Maeve are suddenly and apparently playing with the Lego and the teaspoons and the feathers and the stones on the floor, well, I might just join in with the game. When they’re teenagers, will I remember that my bench and kitchen table were clean for one day, or will I cherish the rainy afternoon when we played a lovely game where the rocks were cars and the feathers were trees and the Lego pieces were a city? And if we’re looking for one more piece of black Lego, I know where it is. Writing sure is your thing, and so not mine even thought I am trying…and trying…. I do love the ‘committed and not attached’ theory. I have always tried the no expectations way, but it just didn’t work for me, too much passion in my veins. I am working on enjoying the journey without worrying about the destination or in my kinder words, process not product. Oh how I love Lego, but a word of warning….black lego underfoot in the middle of the night….yeow!